This issue continues with some tributes to John Bugge and also information about his memorial service on December 8. We are all grateful for his many contributions to EUEC and continue to remember his family at this time. Our previous Lunch Colloquium with Arri Eisen generated a huge amount of interest and that interest led to the longest wait list we have had for a Lunch Colloquium. I greatly regret such situations, but our room will only hold so many people and we don't have a viable alternative, meaning that we have to limit the number of people who can attend. Fortunately you can read Gretchen's article about Arri's talk and the recording should be up on our website soon. I am really looking forward to Bonna Wescoat's Lunch Colloquium next week. I have long had an interest in archeology, and her work is fascinating and path-breaking in terms of digital reconstruction. This year we have a special holiday program on Tuesday, December 11, at 3 p.m. thanks to member Jim Flannery. Jim is the creator of "A Southern Celtic Christmas Concert" that has had much success with live performances in Atlanta and that lives on in PBS broadcasts. He will take us behind the scenes of this production in a lecture-demonstration. This will be a great way to celebrate the holidays! There is also an announcement of next spring's Sheth Lecture, some important healthcare news, and other information I hope you will find interesting. 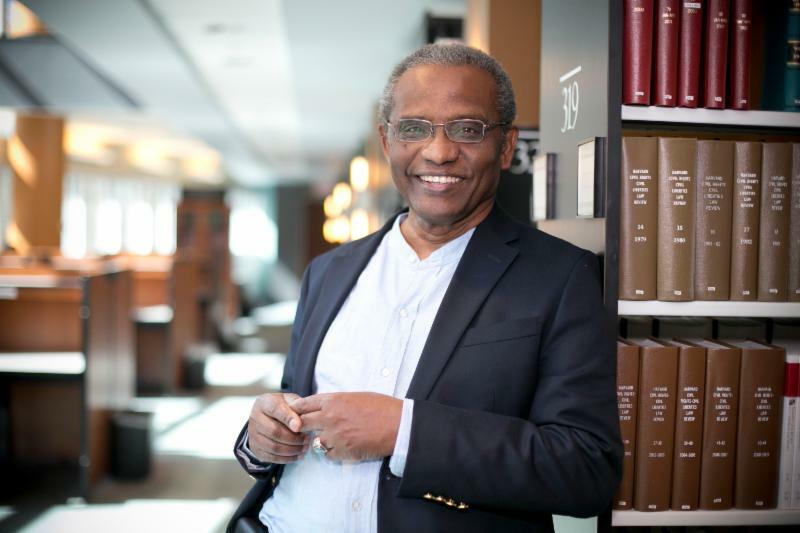 We are delighted to announce that Professor Abdullahi Ahmed An-Na'im, Charles Howard Candler Professor of Law, has agreed to be our Sheth Distinguished Lecturer for next year. 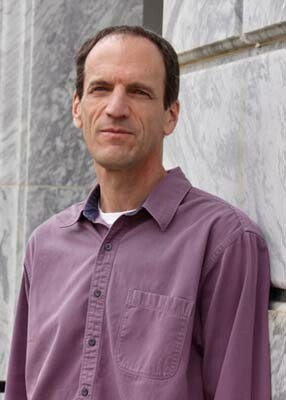 Professor An-Na'im is also an associated professor in the Emory College of Arts and Sciences, and senior fellow of the Center for the Study of Law and Religion of Emory University. An internationally recognized scholar of Islam and human rights and human rights in cross-cultural perspectives, he teaches courses in international law, comparative law, human rights, and Islamic law. His research interests include constitutionalism in Islamic and African countries, secularism, and Islam and politics. He received an LLB (Honours) from the University of Khartoum (Sudan) in 1970, an LLB (Honours) and Diploma in Criminology from the University of Cambridge (England) in 1973, and a PhD (Law) from the University of Edinburgh (Scotland) in 1976. The Sheth Lecture, made possible by a generous donation from Dr. Jagdish and Mrs. Madhu Sheth, will be in Governors Hall of the Miller-Ward Alumni House at 11:30 a.m. on April 8. We continue to celebrate the life of John Bugge, one of the co-founders of the Emeritus College and Chair of our Executive Committee. We offer information about an upcoming memorial service for John and additional tributes. Our analysis of the Medicare Part D stand-alone drug plan landscape for 2019 shows an increase in plan availability for 2019, along with a modest increase in the average monthly PDP premium. Medicare beneficiaries face more than two dozen PDP choices during this year's open enrollment period. Some Part D enrollees who choose to stay in their current plans may see lower premiums and lower cost sharing for their drugs, but others will face higher premiums, deductibles, and cost sharing if they remain in their current plans. As in prior years, all Part D enrollees could benefit from the opportunity to compare plans during open enrollment, since plans vary in numerous ways that can have a significant effect on an enrollee's out-of-pocket spending. Note that to compare plans, you need to input the prescription drugs that you are using; otherwise you cannot do a fair comparison. Open enrollment ends on December 7, so you need to do the plan comparison before that time. Those of you who have access to the resources of the Emory Library have a new source of information. Academic Video Online: The most comprehensive streaming video subscription available to libraries; includes BBC, PBS, Kino Lorber, CBS, and British Film Institute, and FilmMakers Library. This database includes our other streaming audiovideo products from Alexander Street Press, including World History in Video, Ethnographic Video Online, and Oral History Online. You can still limit to just those in our database list. All videos are also available in DiscoverE. 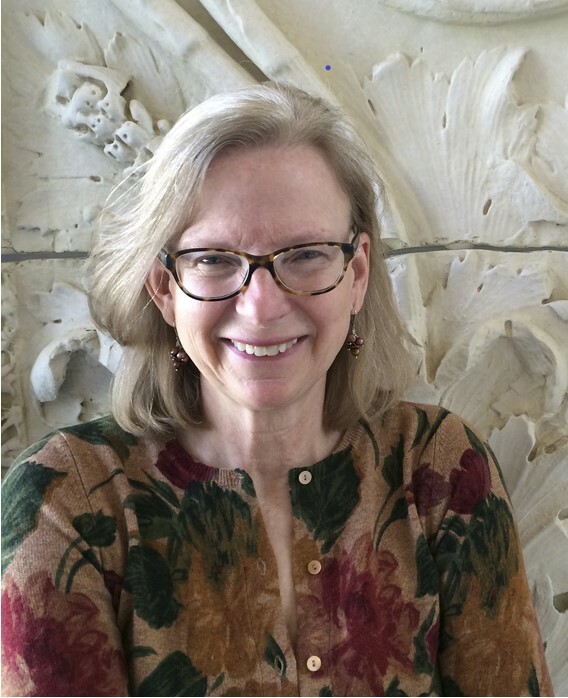 Bonna Wescoat, who has been pursuing her work in archaeology on Samothrace since she was a student in 1977, was named Director of Excavations there in 2012. She and her interdisciplinary team of scholars and students have done much to uncover the history and legacy of the Sanctuary of the Great Gods. The value of these collaborative efforts was recognized when she was named the 2017 recipient of the Archaeological Institute of America's Excellence in Undergraduate Teaching Award. And this year, their value was recognized again when she won a $246,000 Getty Foundation Grant to facilitate further scholar-student research (with participants from many institutions and countries) from northern Greece into the regions of Thrace and the Black Sea. Who better to help us explore the seminal site she has explored for so many years already--and give us a glimpse of the Getty-funded work to come, both there and "Beyond the Northern Aegean"? Bonna Wescoat received an AB in the History of Art from Smith College, an MA in Art and Archaeology of the Roman Empire from the University of London, Institute of Archaeology, and a D Phil in Classical Art and Archaeology form Oxford University. 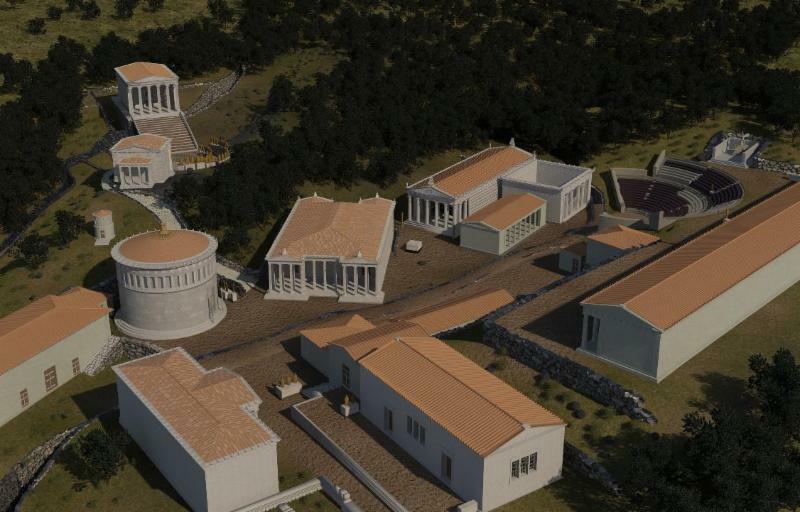 In her teaching, she has sent students combing the campus on scavenger hunts, helped them conduct an optical experiment about the Parthenon frieze, and directed excavations and created 3D renderings in a bid to unravel the mystery of a religious sanctuary important to Greek and Roman antiquity. For her success, Wescoat was honored as the 2017 recipient of the Archaeological Institute of America's Excellence in Undergraduate Teaching Award. 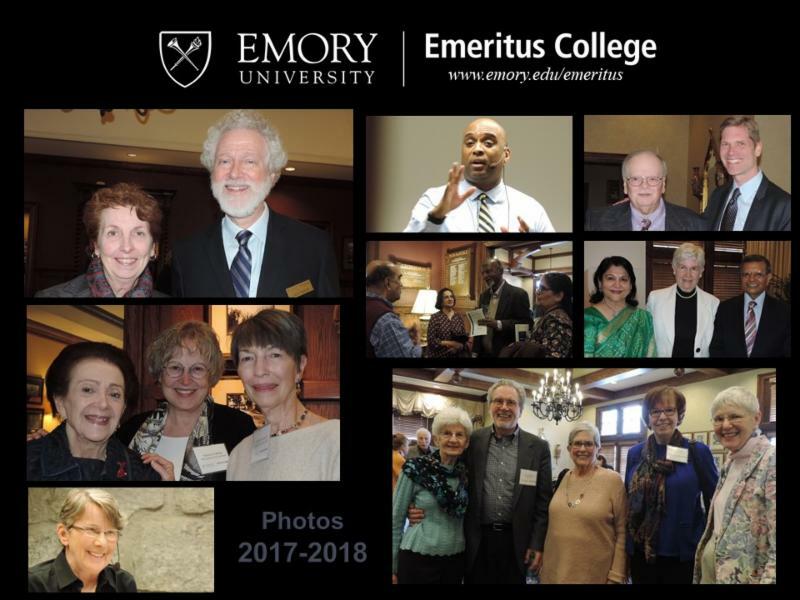 In accepting the award, Wescoat praised the ingenuity of her students and thanked Emory for "saying yes rather than no, for supporting archaeology, art history and classics without question, and for providing an environment in which they can thrive." The national award recognizes individuals who, among other things, have developed innovative teaching methods or interdisciplinary curricula and are actively teaching. "We are the ultimate doers," Wescoat says of her work as an art historian and archeologist. "Antiquities seem remote, but not always. Certainly not when you put yourself in its environment." Wescoat has long put herself into the environments in question. 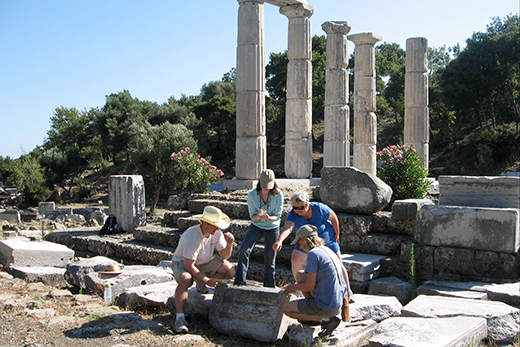 Since 1977, she has traveled to the Greek island of Samothrace for excavations meant to uncover the history and legacy of the Sanctuary of the Great Gods. She was named to the directorship of excavations in 2012, overseeing work at one of the most significant sanctuaries in Greece. Although such a rendering gives a much better idea of what Samothrace looked like, Wescoat's team has done much better! Their website devoted to the Samothrace project can be seen by clicking here. One part of the website is devoted to Visualizing the Sanctuary of the Great Gods. Surely, one of the "coolest" parts of that visualization is a set of videos that reconstruct the experience of an ancient visitor to the complex as that visitor progresses through the Sanctuary. Those videos can be seen by clicking here. In addition to the Samothrace project website, there are a number of recent articles that give more information about Wescoat and her work. She was interviewed for an episode of WABE's Closer Look that can be heard by clicking here. 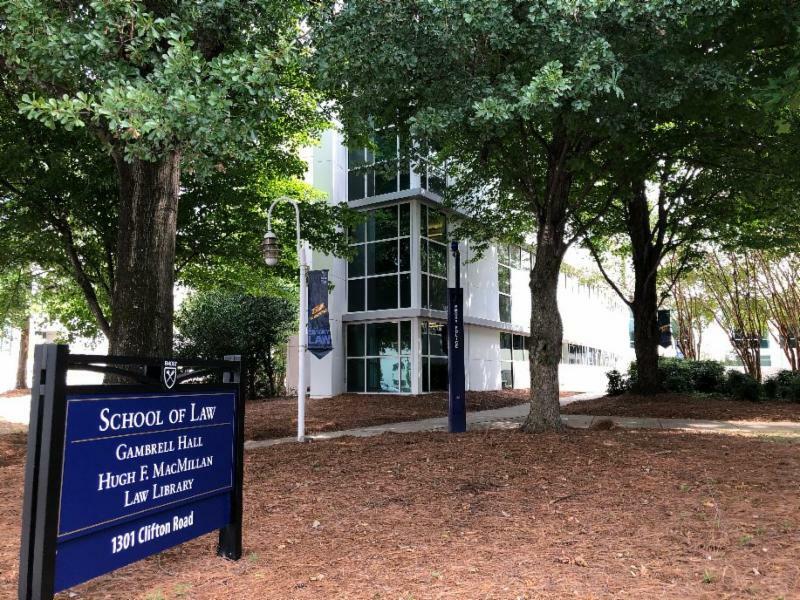 There are also several Emory News articles: one in 2016, one in 2017, and one in 2018. This December will mark the sixth year in a row that PBS viewers across the country will have the opportunity to enjoy an Emmy Award-winning program filmed at the Schwartz Center for Performing Arts under the direction of Emory professor emeritus, James W. Flannery. In poetry, music, song, dance, and story, "A Southern Celtic Christmas Concert" celebrates the high spirits and mystical beauty of the Celtic lands and their connections with similar traditions of the American South. For many years the stage production was a highlight of the Holiday Season for the Emory and greater Atlanta communities. In this special Christmas presentation of the Emeritus College, Dr. Flannery will discuss the challenges of transforming the stage version of the Concert into the PBS film. The Atlanta Journal Constitution once described the concert as a "a rollicking yet reverent occasion." Dr. Flannery will explain how the same balance was striven for in the film through musical pieces performed by Grammy Award-winning artists as well as prayer-poems representing the Medieval tradition of Celtic spirituality, including Seamus Heaney's "St. Kevin and The Blackbird." The film includes a rare interview with Heaney recorded in Glendalough, the ruins of the sixth century Irish monastic community that is the setting of the poem, followed by a recital of the poem by Dr. Flannery. The program also features a number of other Emory faculty members and students in featured roles. Dr. Flannery, who in 2015 received a Distinguished Faculty Award from the Emeritus College, founded Emory's theater program. A producer, stage director, singer, scholar, and educator, he has an international reputation as a specialist in the dramatic work of the poet W.B. Yeats. His own interpretation of poems and songs from "A Southern Celtic Christmas Concert" is bound to be a highlight of his presentation. The following, said when Jim was presented a Distinguished Faculty Award in 2016 by John Bugge, is an excellent summary of JIm's career at Emory. He founded the present Theater Emory in 1982 and helped integrate it with the Department of Theater Studies; it is now nationally recognized as an innovative hybrid enterprise of faculty, active professionals, and students. In 1988 he founded the international W.B. Yeats Foundation at Emory to promote greater understanding and appreciation of Yeats as a poet, dramatist, and cultural activist. From 1989 to 1993 he was the Executive Director of the Yeats International Theatre Festival at Dublin's Abbey Theatre, the National Theatre of Ireland. In 2002 Flannery was honored with a Governor's Award in the Humanities by the Georgia Humanities Council for helping to advance understanding of the influence of Irish culture on the heritage and distinctive culture of the American South. In 2004 he helped to found the Irish Studies Program in the College of Arts and Sciences. In 2010 he was named an International Associate Artist at the Abbey, where he continues to work on developing a Yeats Creative and Performing Arts Studio. 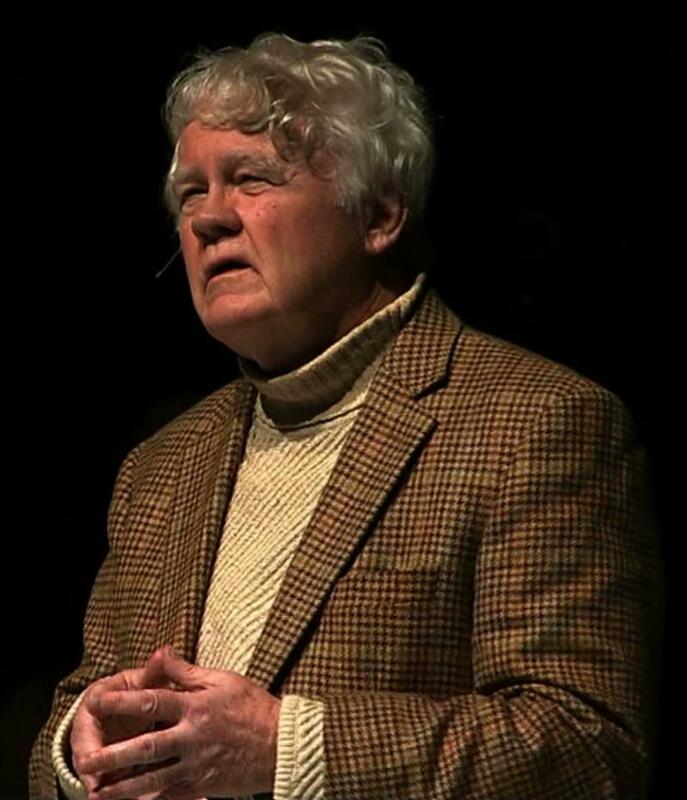 In his years as an active faculty member at Emory, Flannery carried on his research, contributing articles to The New York Times, Performing Arts Journal, and the Irish University Review, and producing a revised edition of his definitive study, W.B Yeats and the Idea of a Theatre: The Early Abbey Theatre in Theory and Practice (Yale, 1989). Flannery's retirement in 2012 did not see any diminution of his activities. For the last three and a half years he has been engaged in ventures that either carry on work begun earlier or constitute new initiatives entirely. In the first category, his very successful local production of the Southern Celtic Christmas Concert is now being distributed nationally by American Public Television to PBS stations across the country. 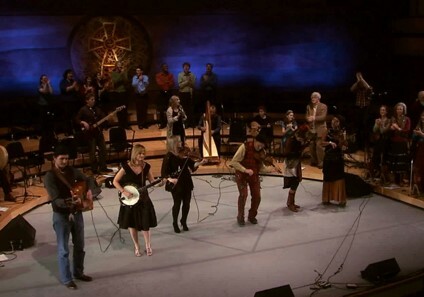 Featuring top talents in Southern and Irish traditional music and a rare interview with the late Seamus Heaney, the program won the Southeast Emmy Award in Outstanding Achievement in Arts and Entertainment in 2012. Flannery also continues to serve as a member of the Global Irish Network; he was appointed to the position by the Irish government in 2010 to advise on issues related to the "Irish diaspora." For the past two years Flannery has been engaged as an advisor to a group from the city of Sligo, which is developing a Yeats Interpretive Center featuring W.B. Yeats and his father, the painter Jack Yeats. In June of 2015 Flannery collaborated with the Irish Consulate of Atlanta to produce at the Carlos Museum a program of readings, critical commentaries, and musical performances entitled "Still Here/Here Still" on the enduring power of Yeats's artistry and poetic philosophy. In 2015 Flannery was elected President of the Metropolitan Atlanta Association of Phi Beta Kappa; in that capacity, he has organized a series of lectures on issues important to the University community. Professor Flannery continues with his academic research and writing on two fronts: a book - which will include audio recordings - entitled Heart Mysteries: Traditional Love Songs of Ireland; and a second book, entitled Memories and Prophesies: A Theatrical Analysis of the Plays of W.B. Yeats. In his "retirement" James Flannery continues to be a highly active scholar, teacher, and critic - and the world's leading expert on the drama of W. B. Yeats. He remains, as well, an accomplished artistic performer, academic administrator, and theatrical entrepreneur. In all these roles he graces the Emeritus College as one of Emory's leading public intellectuals. Among the things members of the Emeritus College had to be thankful for last week was the Lunch Colloquium offered on Monday, the 19th, by Arri Eisen, the Nat C. Robertson Distinguished Teaching Chair in Science and Society and Professor of Pedagogy who's been busy (very busy) among us at Emory since 1990 with appointments in the Department of Biology, and the Institute of the Liberal Arts, and the Center for Ethics. In the intervening years, Arri has been much involved in many of Emory's premier programs, often programs he was charged with founding and directing--and is directing still--programs like FIRST, Fellowships in Research and Science Teaching, one of only a few NIH-funded programs in the country in which fellows do research, learn how to teach, and teach at minority institutions (in our case Spelman, Morehouse, and Clark Atlanta). We might note that few at Emory (or anywhere else) are more deserving of recognition for expertise in pedagogy than Arri, for the FIRST program is only one of many ventures in which he has translated his wide-ranging experience teaching in multiple disciplines at multiple levels into instruction for others teaching or planning to teach. And it was surely that record of achievement in teaching itself--and particularly teaching in the sciences that doesn't ignore but, on the contrary, deliberately engages ethical issues that arise when people are pursuing scientific work--that prompted those who asked Arri to help found and direct yet another of Emory's premier programs, the Emory-Tibet Science Initiative. In discussing what's now been more than a decade of work with ETSI, Arri certainly emphasized how much he learned in the process of helping other learn what he had to teach--and how much he (like the others involved, westerners and easterners alike) has been changed by the interdisciplinary and intercultural experience they have shared. I won't soon forget Arri's description (and photos) of the joy with which students who'd never looked through a microscope before did so--thrilling, too, at images of bacteria projected onto walls--dancing about in their excitement like the bacteria themselves. And I also won't soon forget the passion in Arri's insistence that his views of the world have been transformed, as well. Like those students, he, too, has come to see what he hadn't seen before. Any of us who'd like to know more about the integration of science and spirituality fostered by the Emory-Tibet Science Initiative--and how that Initiative has been "build[ing] a bridge between two complementary systems of knowledge by educating future scientific collaborators who can contribute to new discoveries in the science of mind and body"--might want to read the book in which Arri and Geshe Yungdrung Konchok, one of the monks with whom he has worked closely, published last year: The Enlightened Gene: Biology, Buddhism, and the Convergence that Explains the World. many new biological discoveries--such as the millions of microbes that we now know live together as part of each of us, the connections between those microbes and our immune systems, the nature of our genomes and how they respond to the environment, and how this response might be passed to future generations--can actually be read as moving science closer to spiritual concepts, rather than further away. The Enlightened Gene opens up and lays a foundation for serious conversations, integrating science and spirit in tackling life's big questions. Even if we cannot participate in the ETSI programming that Arri and so many others have found transformative, it would seem this book might itself have some transformative effect, might "fundamentally change the way [we] think"--even (and especially) where "the big questions" are concerned. Maybe it would be a good choice for discussion in one of our Emeritus College Interdisciplinary Seminars. I can't help but think John Bugge would approve . . .
And thanks to Arri for dedicating his presentation to John and the inquiring spirit that made him such an inspiring leader of the Seminars we of the EUEC have enjoyed thus far. Long may they continue. 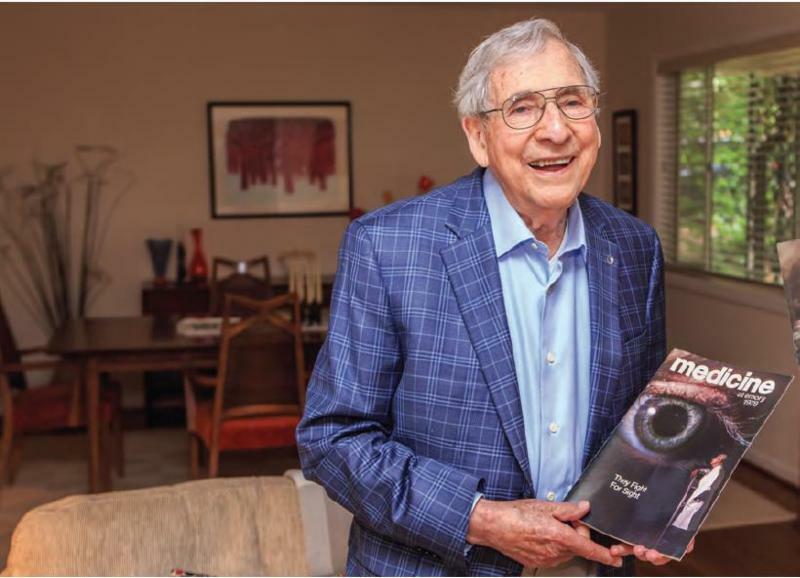 Emory Eye Center's research department began in a simple stone house on the Emory campus with a scientist who became interested in blindness because a class filled a gap in his high school schedule. The man is Morton Waitzman, PhD. The class was an elective designed to provide rehabilitation services for visually impaired students. The entire article is well worth reading and can be seen by clicking here. John's family is having a memorial service and celebration of his life on Saturday, December 8, at 11 a.m. in Cannon Chapel on the Emory campus, followed by a reception in Brooks Commons, one floor below the sanctuary. As you know, the Emeritus College was very dear to John's heart and you are invited to share this time with his family and friends. I realize that many of you will not be able to attend, but I wanted you all to know so that you could be with John's family in your thoughts, if not with your presence. I worked with John closely on one of the many GER revisions and John was masterful in shepherding the faculty through this process. It made a huge difference to our students. Although I had occasionally seen John in Emory's Woodruff library, and in plays, I first encountered him through the "Men's Stories" meetings, which I started attending a few years before I decided to retire. Like most people, I was approaching retirement with some dread. John was an exemplar. When he started the EUEC seminars, I eagerly signed up, and participated regularly until I moved out of the Atlanta area in 2017. It is difficult to overstate how important the EUEC seminars were to me. John was an excellent organizer/moderator, and in the course of participating in the seminars, I learned many new things and re-discovered the skill of close reading long format texts - a skill that is under threat in this digital age. Even though I now live too far away from Emory to participate in the EUEC seminars, I am putting the skills I gained from them to good use in a 2-semester seminar on Islamic history and culture at the University of North Georgia this academic year. 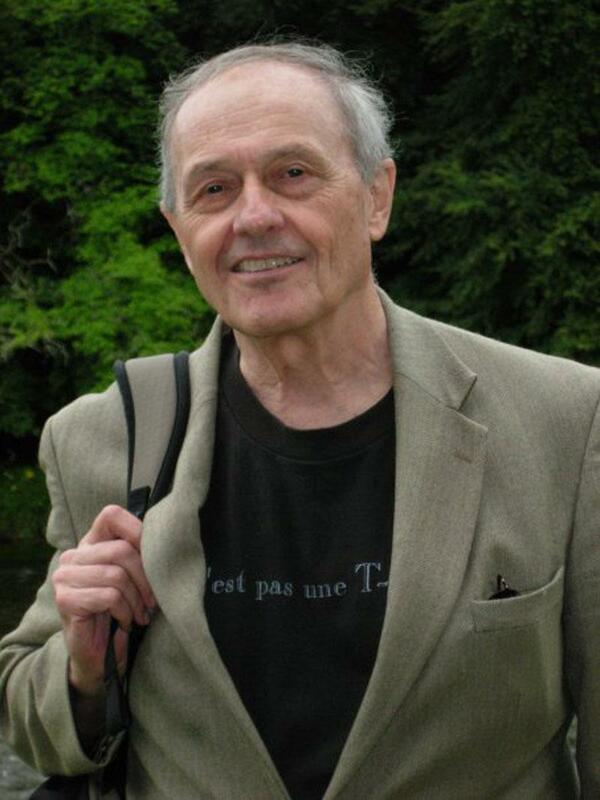 Thank you, John, for many hours of stimulating conversation, intellectual challenge, and guidance. You will be missed. 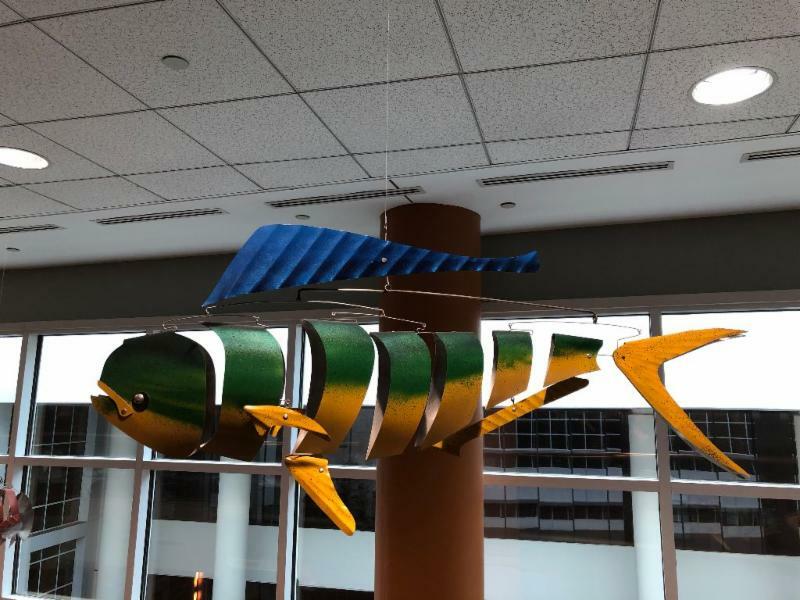 Did anyone figure out where the big fish was located on campus? Believe it or not, you can find it and a few others in the School of Law, Hugh F. MacMillan Law Library. 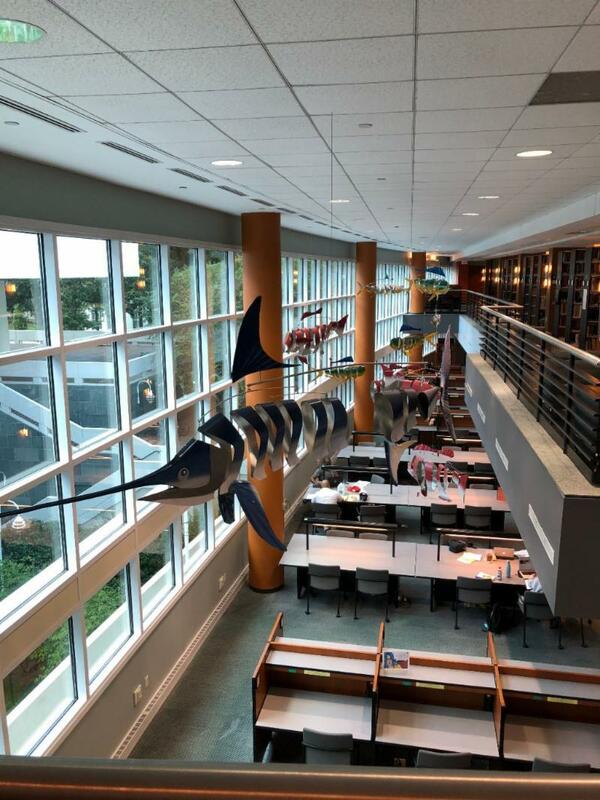 All aquatic figures are easily visible in the open area from any floor. They are quite large and very colorful. I've supplied additional photos below. 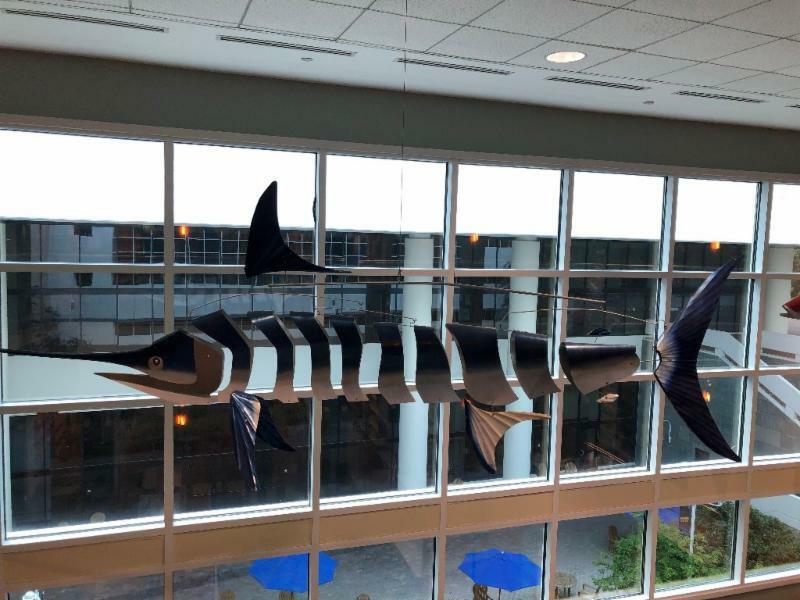 You may need an Emory ID Card to enter the library, although I'm sure if you tell the attendant at the desk you just want to swim with the fish, they might let you in! If at all possible, take a look....it's an unexpected fun spot on campus. As of this writing, it has rained for, I believe, four or five days in a row. How about we stay inside for a bit longer? 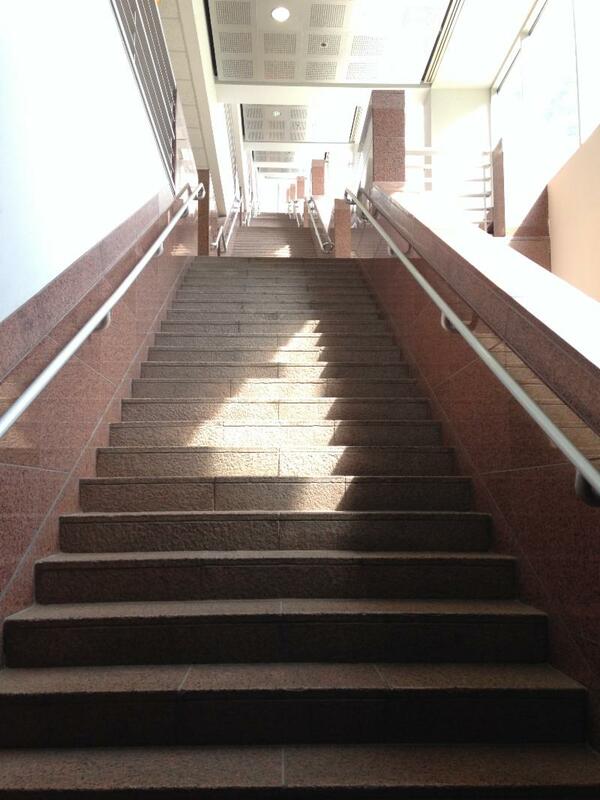 Do you feel like climbing a few stairs? This next spot has plenty of them! As you can see, the day I visited this building it was quite sunny.